Muhu is an island off the Western coast of Estonia. The women who inhabit this region are renowned for their production of accomplished, elaborate, multi-coloured textiles. 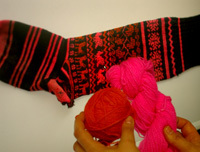 A vibrant shade of pink is prevalent in many examples of handiwork from Muhu, as can be seen in these socks, which are held in the collection of the Estonian National Museum. Designs and Patterns from Muhu Island details the distinctive textiles of Muhu Island and was written by Anu Kabur, Anu Pink and Mai Meriste, and published by Saara Publishers Ltd.
Kata is an Estonian knitter with very quick fingers and a talent for colour. She has created a recipe for Muhu Pink, and kindly allowed Felicity Ford to record the sounds of colouring yarn in this distinctive shade. Kata’s family live in the same district as Saara Publishing Ltd., so after dyeing the yarn, Kata took Felicity to meet Anu Pink. At Saara, the intricacies of the Muhu Island book were discussed, as was the accuracy of Kata’s version of Muhu Pink, which is known in Estonian as Kiperoosa. You can hear below the sounds of Kiperoosa yarns being dyed, and you can see Anu Pink comparing a photograph on her computer with Kata’s colour. The recording details Kata’s thoughts on Muhu Pink; the rinsing and washing out of the dyepot in Kata’s shower-room; the weighing out of the dye chemicals; the addition of yarn to the dyebath; and the addition of vinegar to the dye-bath to fix the acid dyes. 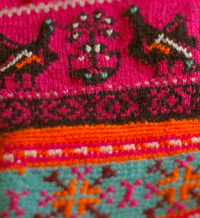 Finally, here is a close-up of some gloves which – in a style characteristic of Muhu’s talented needlewomen – combine cross-stitch, crochet, embroidery and coloured knitting in a single garment. They belong in Anu Pink’s collection of Muhu textiles and were in all likelihood made to demonstrate the skills of the maker (and her suitability for marriage) than to be comfortable or practical garments! In exchange for this Estonian textile sound, some sounds from the UK of yarn being dyed with Woad are additionally presented below. 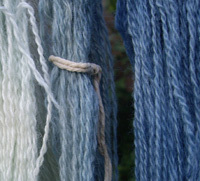 To create this recording, Woad was grown in Felicity Ford’s garden in Reading, Berkshire, and was used to dye some plain white yarn a range of different blue shades. 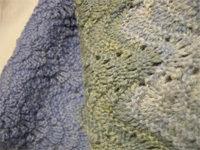 The resulting blue yarns were knitted up with other yarns dyed with plants from Felicity’s garden, in order to create a kind of knitted representation of the plants (both wild and cultivated) growing in her particular region of the world. The recording details the picking and washing of Woad leaves; the squeezing out and rinsing of those leaves into a dye bath; the addition of bicarbonate of soda to the dyebath (for alkalinity); the aeration of the dye-bath in order to introduce oxygen; and the gentle simmering of yarns in the dye-bath. Above the sound-recording you can see the yarn dyed in the Woad bath and the scarf that was knitted with it. The scarf was designed to be both serviceable and useful, acting as a reference for future plant-dyeing projects, and as a warm scarf. There is no distinctive tradition of knitting lace scarves in Berkshire, but the plants used to make the colours in the scarf relate to the landscape in a very literal manner, being directly of and from it.